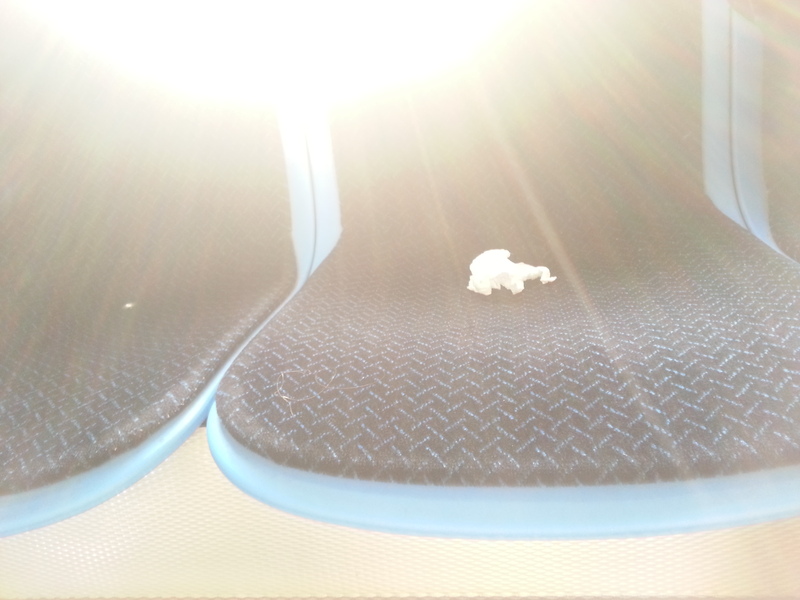 A used tissue occupied the middle of the five seats at the back of the bus, crumpled and sticky white against the blue fabric. I chose a seat next to the window, leaving an empty seat between me and the nasal debris. At the next stop an elderly man entered and chose the seat next to the opposite window. Then a third man approached, and I could tell he’d spotted the middle seat from a distance and was eagerly headed for its comfortable space. He’d failed to remove his sunglasses, hindering his view. I thought for sure he was going to plop down on the mucosal discharge. I couldn’t believe it. I wondered if I should speak up and spare him the embarrassment. That was the right thing to do, wasn’t it? Ultimately, however, we’re all on our own. Before I could muster up the courage he spotted the offending rag at the last second and in the process of sitting on top of it he shifted directly into the seat next to the elderly man, who was still resting against the opposite window, letting the tissue have its way. It had won. The man sacrificed his spatial freedom to nuzzle up to the elderly man rather than wrestle with the snotty encumbrance. We rumbled on. People came and went, choosing less comfortable options whilst the tissue sat proudly, occupying its throne. I wondered if I should remove it myself – not to be noble, no, for selfish reasons – it might cause someone to choose the seat next to me, invading my personal space to avoid the contaminated fabric. I could use my backpack to brush it to the floor, though its contents could potentially latch onto my bag and then to my back, or I could use my shoe to do the same. Doing so, however, would require a public display. I would have to raise my leg above the seat and use my foot to drag the rag to the floor, possibly failing in my first attempt, which would only cause a repeated, foolish-looking effort. Everyone within eyesight would turn to watch, or at least do so through the corner of their eyes, as I combated with the diseased hanky. They’d wonder why I would do such a thing. They’d look at me disdainfully, someone who thought of himself as righteous, superior than the apathetic masses. I’d given up my seat to a woman once and she thanked me profusely, loud enough for everyone to hear, as if I were a man amongst men, but all it did was make me stand out in the crowd. Who was I, they were thinking, to be so gallant? I felt embarrassed. It just wasn’t done in our current society unless the woman was old or pregnant or disabled. I’d made other men look bad, as many other women stood in the aisles, clasping onto the hanging straps. The men looked away, pretending not to see them, too wrapped up in their phones or their supposed exhaustion. Another time I approached an empty seat and asked the woman standing next to it if she would like to sit down. “No I would not,” she said. I was surprised she hadn’t added “fool” to the end of her sentence, such was her attitude. I sat down and nearby men glanced in my direction. See, they were thinking, that’s what you get for asking, idiot. So I couldn’t do it. I didn’t want to draw more unwanted attention. It wasn’t my responsibility to remove the nostril rubbish. Fortunately the younger man with the sunglasses departed and the next victim approached, a large woman with a shopping bag. She chose to take Mr. Sunglasses place next to the elderly man, once again leaving the aforementioned phlegm-filled cloth be, as if it were a mangy rabid dog. Eventually the three middle seats were once again empty, the spoiled napkin enjoying its command with only its two jesters nearby, me and the elderly man pressed up against our respective windows. I thought the situation would never end. They say people have died in their seats and cruised around the city unnoticed for days. Though I doubt the veracity of such stories, one never knows. I thought I might find the tissue still in its vaunted place on the ride home, or a week later, maybe a month. At the next stop a mother entered the bus with her two kids. They approached the rear, no other seats being available. I knew the valiant, gentlemanly, heroically thing to do was to remove the toxic tissue out of her way. After all, her hands were full. I watched her innocent children ambling down the aisle, unaware of the pollutants that lie ahead; I looked at the discarded sinus secretion sitting so smugly in its position of power, conniving, blatantly challenging the social contract to help each other out, giving up some of our natural rights for the greater good, to act as civilized human beings rather than be witness to another’s public humiliation – blasphemous thoughts these days, I know. A quick swipe and the deed would be done. She might have even acknowledged my kindness and smile, even say thank you, and I’d feel better about who I was trying to be. I’m not proud of it. Such was the power of that revolting tissue. The tired mother was on her own, as always. She appeared frazzled, browbeaten, disheveled. If anyone needed help it was her. And yet, miraculously, she saw the offending slime rag and removed it herself, with her bare hand no less, without hesitation, without a hint of self-consciousness, letting it drop to the floor as if it were nothing more than harmless material from one of her own children. She sat down in the middle seat with a child on each side, unconcerned about any flaky remnants awaiting her derriere – more evidence that mothers should be in charge – but aren’t because they would demand we do things, such as take out the garbage or clean up after ourselves, as individuals, as corporations, as armies. Everyone breathed a sigh of relief, the tissue returned to its proper place, beneath us, and we enjoyed the rest of our ride. Why was it always a mother, I wondered, more concerned with the welfare of her children than her personal hygiene or any communicable disease, to set things right? The bus continued down the street, each of us using our bare flesh to hold onto the buses metal bars or hanging straps, covered as they were with the filthy, bacterial-laden fingerprints of an entire city. I tried to ignore the tissue on the floor, where it patiently waited, though sometimes it captured my eye. It hadn’t given up, it tormented us still, and I realized it always would. Luckily the mother wasn’t mine, she might have told me to dispose of it properly, even as I objected that I wasn’t the one who had put it there. Tags: environment, fiction, humor, Nature, stories, writing. Bookmark the permalink. Love it. Great read on ‘man’s’ obsession with the trivial. I wonder how many of us endure these internal social dialogues. I know I’m guilty:) Judging from the comment above, which I just read, I’m guessing that most of us think about such things in varying degrees;) A really good read. You mean I’m not alone in this? 🙂 Thanks! Very cleverly written Jim. Much enjoyed!